The PhoBlograpHusband and I live in the Plateau, adjacent to Mile End, which is the neighborhood with restaurants more our speed. Eating out in Montreal is caustically 'spensive, I find, and I say this having moved here from New York. The difference is, it's just as easy to find really good cheap food in New York (slice at Joe's, Corner Bistro burger, zomg patacones) as it is pricey food. So far, that hasn't been the case for us in Mtl/Le Plateau, but the Mile End boasts numerous little boites serving interesting little plates where you can leave sated (not stuffed) for under $100 including tax(es) and tip. We have learned to consider that a bargain. So our friend Tao had recommended Cafe Sardine and we went there Friday night, no reservation, easily seated right away. By its looks, this was my kind of place: open kitchen, salvaged-everything furnishings, and all-male staff, one more closely resembling a member of Vampire Weekend than the last. As has become my custom, I asked if the bartender (a friend of Tao's) would make me any kind of mocktail. And what I got was the aforementioned virgin Bloody Caesar. 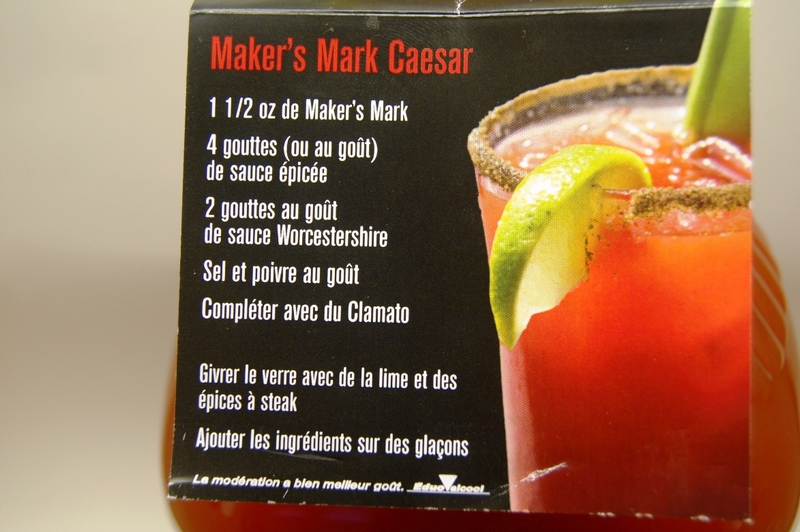 Coincidentally, one time when we were buying Maker's Mark up here, the bottle came with a hangtagged recipe for the Maker's Mark Bloody Caesar, so on Sunday Sean and I used that recipe as a launching pad for a Bloody Caesar tailored to our liking. Combine all liquid ingredients plus black pepper in a tall, ice-filled glass. Dump all contents into a shaker and shake vigorously. Set shaker aside for a moment while you rim your glass with New Bay and refill it with fresh ice. Strain drink back into glass and enjoy. Yes, that's a bottle of Buffalo Trace in one of the pics above, but it contains Heaven Hill, which I believe Sean transferred into there to somehow feel better about his station in life. Obviously, any bourbon will do, and I'd recommend not going any more top-shelf than Maker's/Buffalo. Why all the glass-to-shaker-to-glass hoopla? 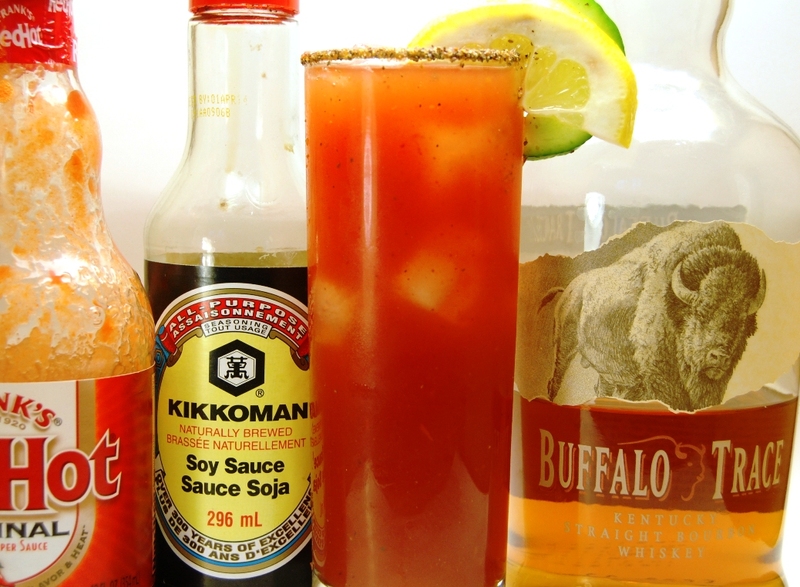 So's your "fill" portion of Clamato is accurate. 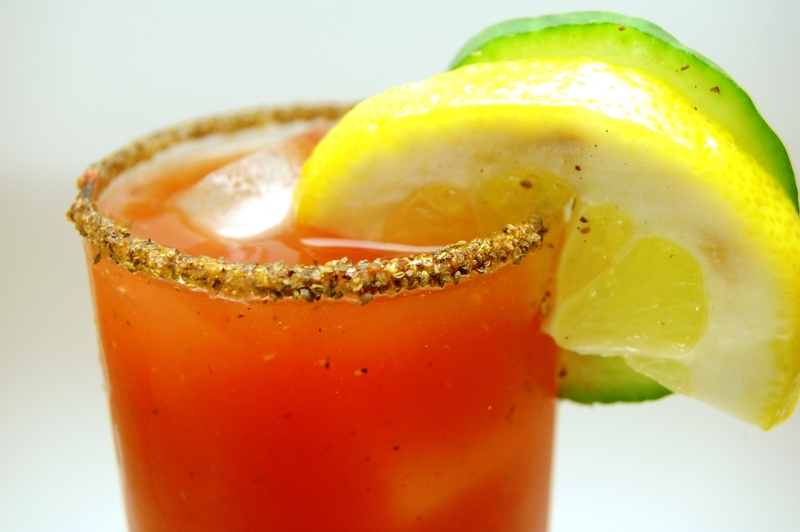 Not even a pregnant lady wants a weak Bloody Caesar.